Does your loved one with Alzheimer’s or mid- to advanced-stage dementia regularly have a mini “meltdown” at night or increased confusion? It’s called sundown syndrome or sundowning, and it’s the name for a collection of disruptive symptoms that usually appear in the late afternoon, in the evening or into the night. Behaviors may include agitation, anxiety, aggressiveness and yelling, as well as confusion, disorientation, pacing and wandering, according to a study published in Psychiatry Investigation . Sundown syndrome is largely a mystery to doctors. It can be alarming and stressful for both you and your loved one. Here are the common triggers to know as well as seven tips for coping. Medical experts and scientists don’t completely understand what causes sundown syndrome. However, it can be triggered by a flurry of activity at night. If your loved one lives in an assisted care facility, the afternoon shift change and activity can lead to anxiety or confusion. Because the causes are unknown, treatments are not well established. There is no pill to take to make sundown syndrome more manageable. There are, however, things you can do to help your loved one cope. Daily routines around waking, meals and sleeping can help the elderly feel safe by minimizing surprises and establishing reliable activities. This can help to reduce anxiety and confusion and increase the likelihood of restful sleep. There may be a correlation between the foods your loved one eats and the symptoms he or she exhibits. Avoiding caffeine and sugary foods in the later part of the day can help to keep sundown syndrome under control. Keeping a food diary can help to identify the foods that trigger symptoms. Limit the television, radio and other devices in the evening to calming music, and avoid evening visits from people outside the household. This may reduce nighttime stimulation that delays sleep and protect your loved one’s stress and anxiety levels. These things can make it harder to fall asleep at night. Plug in night lights and turn on lights early, so as the daylight fades interior lighting can take over without a dip into darkness. Keeping rooms well-lit can also help your loved one to feel more secure as he or she moves around his or her home. Caring for a loved one who has sundown syndrome can cause disruptions in your own sleep, caregiver stress and increased likelihood of burnout. If you are concerned your loved one may have sundown syndrome, speak with your health care provider. Working closely with your health care provider, you can diagnosis and develop strategies for successfully coping with the symptoms of sundown syndrome. 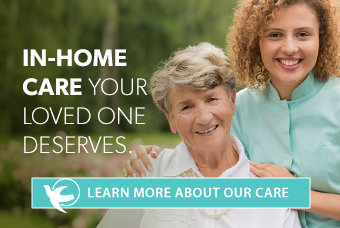 For more information on caring for a loved one with dementia, click here.